– Who is in charge? – What do they want? The United States of America is de-laminating: when even so solemn an outlet as Foreign Policy magazine wonders “Is America a Failing State?” it starts to become a commonplace. Build a gas pipeline from Qatar into Europe. Weaken Russia by striking at an ally and cutting its gas sales. Obey orders from Jerusalem and Riyadh to weaken Syria/Iran. Arrogance, ignorance, overconfidence, “exceptionalism” and other delusions. Create chaos so the USA will still be king of the hill even if the hill is smaller. Something I haven’t thought of. Some or all of the above. But trying to work out Washington’s policy is, to quote an alleged Churchillism about the USSR, like watching bulldogs fighting under a rug. You see that something is happening, you hear growls, but you don’t know who is doing what to whom or why. For example, last year then US Secretary of State Kerry and Russian Foreign Minister Lavrov spent days negotiating a truce in Syria; within a few days the US military attacked the Syrian Army at Deir ez Zor. Who was in charge then? And what was the purpose of either of these actions? No wonder the Russians have concluded that Washington is nedogovorosposobny: no agreement is possible either because it can’t make one or it won’t keep it. But what we can say is: whatever Washington, in whole or parts thereof, its sponsors or controllers, was or were trying to do in Syria, they have failed. 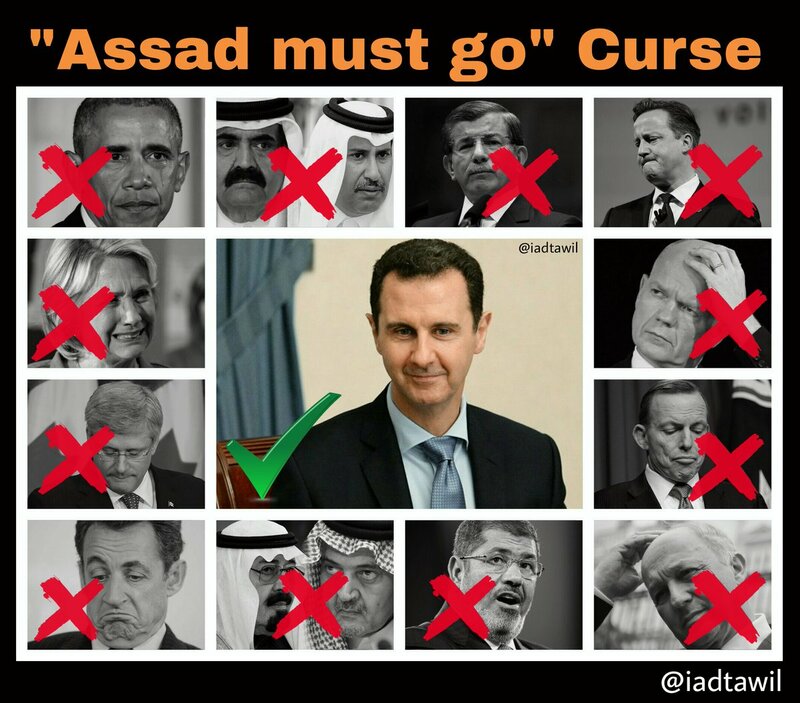 The momentum, which seemed to be swinging against Assad two years ago, has reversed since Russia’s intervention and been replaced with the mockery of the “Assad must go curse“. Assad remains in power and supported by the population; Iran has gained power and influence; Jerusalem and Riyadh are nervous and unhappy; Russia is more influential and – most consequentially – shown to be reliable and effective; no gas pipeline will be built without the agreement of the Syrian government. Chaos has been reduced, order increased. Syria is the Thermopylae of the new New World Order. Every day the USA loses its position in the neighbourhood in proportion as Russia, Iran, Syria and Turkey increase theirs. Failure. Defeat. Washington isn’t good at admitting defeat and it always comes up with another gimcrack scheme to postpone the day. But the Kurdish surrogates aren’t doing well and the latest bright idea in Afghanistan is a loser too. So we have to contemplate the shape of The End. A surrender ceremony on the deck of the USS Missouri in Tokyo Bay. Destruction, overthrow, walk away, amnesia; the proclaimed success is never connected to the consequent chaos. (This is today’s prevailing pattern – see Kosovo, Somalia or Libya). Helicopters lifting off the Embassy roof in Saigon. It won’t be number one, it’s probably too late for number two so I guess we must look forward to helicopters on American Embassy roofs. Unless President Trump can break the habit. Which brings us to another unanswerable question. When campaigning, his rhetoric suggested that he had the beginnings of understanding. His slogan, “Make America Great” had the important addition “Again”. Which suggested that it wasn’t “Great” any more. It seemed to me that he understood that the endless (and unsuccessful) wars were a cause of that loss of “greatness”. This was encouraging to those of us who hoped for an end to the wars. His Inauguration Address continued the theme that Washington should mind its own business. But, since his election he has been hobbled by the accusation that he is Putin’s poodle. The US media, the US intelligence agencies (or, more correctly, “hand-picked, seasoned” members of same) have banged this drum since the DNC, caught fixing the nomination, blamed Russia. This hysteria has crippled his attempts to have better relations with Russia and move away from the neocon and humanitarian bomber catastrophes of the past. No one could have foreseen this month-in-month-out shrieking. Nor predict how loudly stupid it would become: “Catalonia held a referendum. Russia won”, Pokemon and cute puppies. Trump has been under constraints he could never have expected. Maybe the lunacy will turn on its creators with the new revelations about Uranium One and the Steele dossier, maybe it won’t: I’ve given up trying to predict the craziness. So we must add the Trump Mystery to the other Mysteries. Although there may be a clue. He has had four foreign affairs issues to deal with so far: Russia, North Korea, Iran and Syria. He is very constrained on the first, loud and boorish on the second and third but interestingly quiet on the fourth. There was the cruise missile strike but I was and still am convinced that that was a theatrical production. What we do have is his decree ending CIA support for anti-Assad rebels. That is an action, the rest is talk. Maybe we should watch what he does, not what he says. But still: we don’t know. We don’t know what Washington was trying to do in Syria. We don’t know whether all Washington was agreed on what it was trying to do in Syria. We don’t know if any agency in Washington had a plan in Syria. We don’t know who was making decisions in Washington then. We don’t know who’s making decisions in Washington now. We don’t know whether there is any unified position in Washington on Syria. Or anything else. We don’t know what Trump wants. We don’t know what Trump can do. We don’t know who’s running the place. Or whether anyone is.